Why Did I Start Writing? My writing career began soon after I became a member of the Osprey Fly Fishers of B.C. The club continues to produce a monthly newsletter detailing the clubs activities and a variety of articles contributed by the membership. The editor at the time, and with all editors who have followed, continuously canvassed members for contributions. After much prodding, I began submitting articles fuelled by a compulsive desire to not so much provide a blow-by-blow destination descriptions but rather pass along my findings with the hope to educate and inform others. From my newsletter beginnings I began approaching magazines with potential article submissions. My initial forays were not encouraging. I was met with polite professional rejection letters. 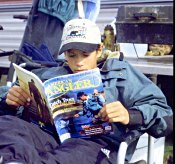 Buoyed by support from friends and family I persevered and thanks to American Angler and then editor Art Sheck, who published my first article, I ventured into the field of outdoor writing. Since that initial break in my writing career, I have been fortunate to write for every major fly-fishing publication in North America including an article transposed to the Japanese edition of Fly Fisherman. At the same time, concepts for books began brewing in my mind and I finally put pen or more appropriately fingers to keyboard completing my first book, Fly Patterns for Stillwaters. Since my first book, I have completed or co authored a number of other books including Fly Fishing British Columbia and Stillwater Solutions Recipes with good friend Brian Chan. I have plans for at least two more. With each trip comes new experiences and knowledge, all potential sources for future articles and books. I remember the learning curve for fly fishers can be and remains steep, a godsend of sorts that keeps all fly fishers in a state of continuous improvement or "Kaizen". I enjoy helping others whenever I can. I am not one prone to secrets. If it were not for other fly fishers and writers passing on their knowledge and experiences, fly-fishing would not be the all-encompassing passion it is. No one ever seems to master this sport. Mother Nature makes sure of that!